Snowy egrets (Egretta thula) are white waterbirds belonging to the heron family, Ardeidae. 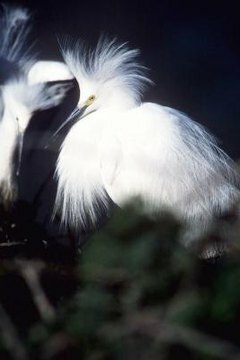 Common throughout the Americas, snowy egrets breed in coastal estuaries and inland waterways. The males and females look identical with white-plumed bodies perched above black legs that end in orange feet. Both sexes grow to heights exceeding 2 feet. Without a medical examination, the only noticeable difference between male and female snowy egrets is size. Males are only slightly larger than the females, and unless you are looking at a bonded pair next to each other, you will not be able to tell which is male or female. Breeding behavior is the surest indication of gender in snowy egrets. The male's feet will change to reddish-orange; he will perform elaborate flights and vocalizations to attract the female. He will stretch his beak toward the sky while his body bounces up and down to woo his mate. The pair mates with the male on top of the female's back. The female builds the nest while the male stands guard to defend the territory. Both males and females sit on the nest, so your gender-determining observation period is pretty limited.